Tetro™ Reverse Transcriptase is a highly sensitive, high stability MMLV reverse transcriptase. Tetro Reverse Transcriptase is optimized for reverse transcription reactions using a wide range of total RNA amounts, such that long and low abundance cDNAs can be detected by amplification after cDNA synthesis. Tetro Reverse Transcriptase is suitable for first-strand cDNA synthesis, cDNA library construction, and the production of templates for RT-PCR analysis of gene expression. Tetro™ Reverse Transcriptase is a Moloney Murine Leukaemia Virus (MMLV) Reverse Transcriptase, which exhibits high stability, with no loss of activity following 1 week at room temperature. Tetro Reverse Transcriptase is highly sensitive even when the amount of template is a limiting factor (fig. 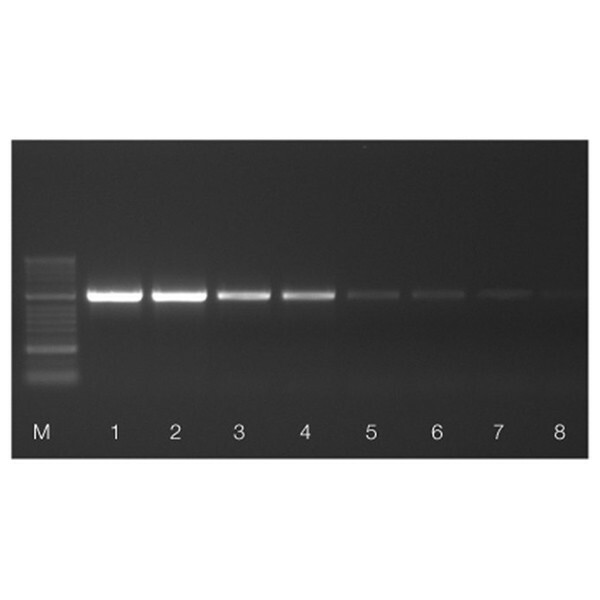 1), with highly efficient and sensitive transcription, from as little as 10 pg, up to 2 μg of RNA (fig. 2). Many RNA transcripts form stable secondary structures at lower temperatures, making them less suitable as templates for RT-PCR at those temperatures. Tetro Reverse Transcriptase is suitable for first-strand cDNA synthesis, with total RNA, mRNA and in vitro transcribed RNA and shows excellent performance with gene-specific primers, Oligo (dT) as well as random hexamers, making it perfect for cDNA library construction and the production of templates for RT-PCR analysis of gene expression. Fig. 1 High sensitivity of Tetro Reverse Transcriptase on mouse total RNA. A five-fold serial dilution of total RNA from mouse brain (1 μg to 10 pg) was reverse transcribed using 50 Units of Tetro Reverse Transcriptase, oligo (dT)18 abd random hexamers. The resultant cDNA was then used as template in a PCR using primers for amplification of a 700 bp fragment from mouse b-actin. Lanes 1-5 correspond to PCR product from the serial dilution above, reactions were carried out in duplicate. HyperLadder 50bp (M). Fig. 2 High sensitivity on human DNA. A ten-fold serial dilution of human total RNA (1 μg to 10 pg) was reverse transcribed using Tetro Reverse Transcriptase and oligo (dT)18. The resultant cDNA was then used as a template in a PCR using primers for amplification of a 470 bp fragment from human GAPDH. Lanes 1-5 correspond to PCR product from the serial dilution above, reactions were carried out in duplicate. HyperLadder 50bp (M). All components should be stored at -20°C upon receipt. When stored under the recommended conditions and handled correctly, full activity of the kit is retained until the expiry date on the outer box label. I want to generate cDNA from RNA with high secondary structure. What do I have to consider? For SensiFAST cDNA Synthesis Kit: The TransAmp Buffer already contains reverse transcriptase enhancers that reduce complex RNA secondary structure. For templates that have a high degree of structure, such as viral RNA and some plant RNA, we suggest using an additional 15 minute 48°C incubation step as mentioned in the manual. For Tetro cDNA Synthesis Kit: For samples with high secondary structure we suggest to denature the RNA template with primers prior to the reaction set-up. Furthermore, it is necessary to optimize the incubation time and temperature. The temperature of the RT step may be raised up to a maximum of 48°C. What would be the recommended amount of cDNA generated with these kits to use in PCR reactions? What are common recommendations for sample dilution? The necessary amount of cDNA template for PCR or qPCR reactions may vary from the range of pg up to several hundred ng. It depends among other things on the analyzed target, the used application and sample characteristics. If you do not have empirical values for your assays please use the recommended amounts in the manuals of your PCR or qPCR assays and optimize if necessary. Is it possible to use gene specific primer for cDNA synthesis with Bioline kits and what are the advantages? It is not possible for the SensiFAST cDNA Synthesis Kit. Random Hexamer and oligo dT primer are already included in the optimized TransAmp buffer. It is possible to use gene specific primer for the Tetro cDNA Synthesis Kit to generate cDNA for specific target. What are the differences / recommended applications for the SensiFAST and Tetro cDNA Synthesis kits? The SensiFAST cDNA Synthesis Kit has been designed for rapid generation and unbiased coverage of cDNA, especially for subsequent quantification with real-time PCR. The optimized 5x TransAmp buffer includes all necessary components for cDNA synthesis, including a unique blend of oligo dT and random hexamer primers and the RiboSafe RNase Inhibitor. The Tetro cDNA Synthesis Kit is the more flexible solution. You selects the desired setup, especially the desired RT primer. The Tetro Kit is optimized to work over a wide range of RNA concentrations and to obtain full length cDNA, which can be used for two-step PCR assays as well. Tetro is the recommended Kit for the generation of cDNA libraries and cloning.